Especially if you’d asked my brother who always told me how much he loved it and that he hoped one day I’ll try. But then against all expectations I did and I loved it. I was travelling for my PR work to Egypt, accompanying journalists to a hotel that is our client down there. 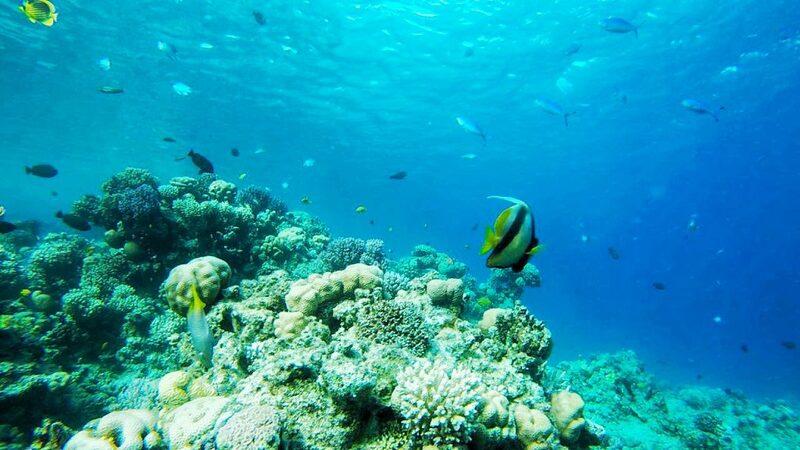 One day we had a snorkelling boat trip to Tiran Island scheduled. The weather wasn’t great and therefore on the boat it was super cold. I am not a person, that never tries anything new! If you have followed for example my trip to the monastery close to Barcelona, you know that. I am a person driven by moments. If I think too much about anything, then I won’t do it anymore. The organisers offered us surprisingly, that we could also go diving. 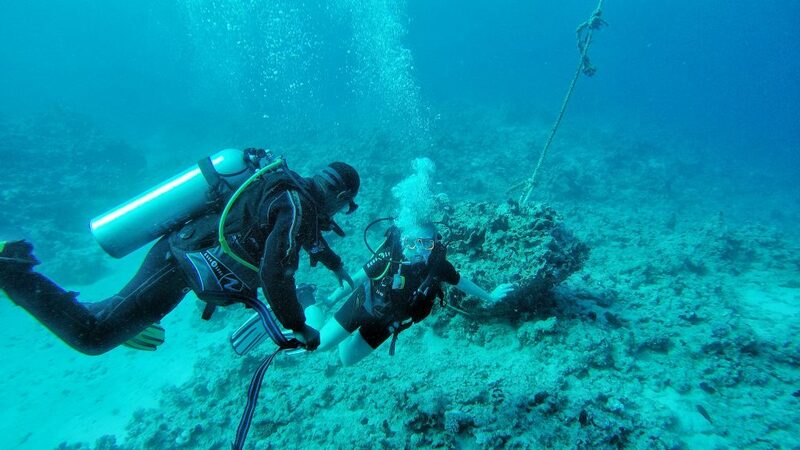 No one of our group had ever dived before but two of the girls simply said yes without hesitation. A third one of our group did then afterwards as well. I was still in ‘I don’t want to go diving mood’, but I sat down together with the girls to listen to the first instructions. It all felt quite simple, nothing to concentrate on but breathing in, breathing out and controlling the pressure in your body. I really did get along well with the group and when will I ever get the chance to be amongst 3 girls going to dive the first time again? 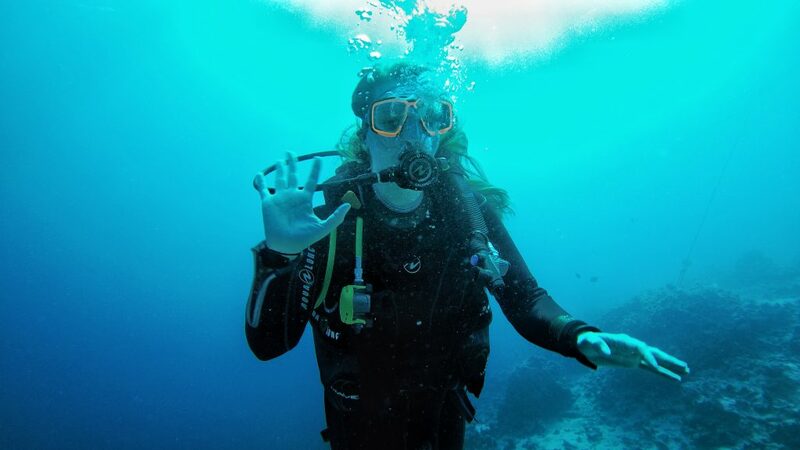 ‘So hell yeah!‘ I decided this is the moment I will try something new: I will go diving! When I have a lot of time to think something through, then I find 1000 reasons what could possibly go wrong. Luckily this time it did not come this far! Of course it was just a ‘diving test‘ but still it was quite awesome to be honest. We needed to wear the full diving suit, received a mask, flippers and the diving equipment. I was sitting on the side of the boat ready to start my first diving experience. I got put on the diving equipment, while one instructor was awaiting me inside the water. Another one was basically pushing me in the sea. Not because I wouldn’t want to jump, just because the compressed air bottle was so heavy I couldn’t have moved. The instructor was just in front of me checking, if everything was fine and if I was afraid. Then I started to use the mouth piece by breathing trough it slowly. It was hard. It felt like I had to breath real strong in, in order to get the air in to my lunges. The instructor guided me slowly to put my face under the water. The breathing felt even harder and I was sure I wasn’t getting enough air – so I rushed back up again and took it out of my mouth. He then explained me, that this is something nearly everyone is experiencing they first time, but that I just had to trust that I will get enough air, if I breathe in more relaxed. So second try, I was still nearly hyperventilating till I remembered what he just had told me and relaxed. We started to go downwards slowly. The only two things I had to concentrate on was breathing deeply and the pressure equalisation of my body. It was way easier than what I ever could have expected. it the first place? 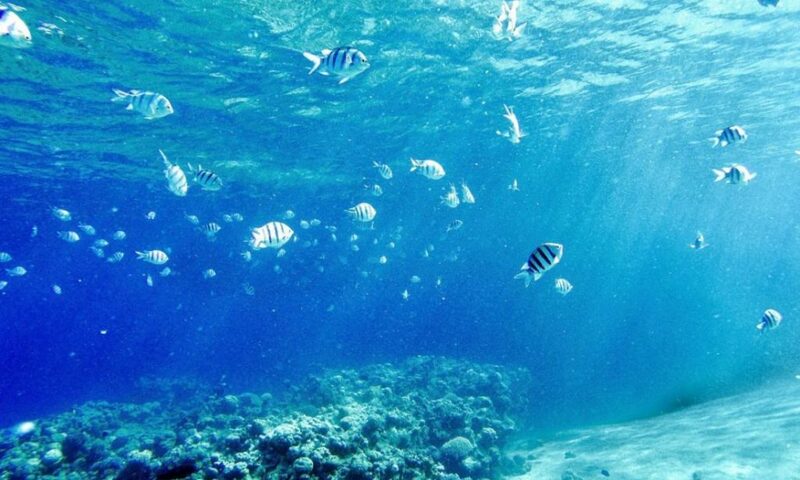 Well, do ou know the feeling when you are snorkelling for a long time as suddenly get to a darker area? All sea grass around you, you seem to see dark shadows of animals you can’t define? Well that is my reason! I have too much respect of the sea, it’s strength and it’s inhabitants. The more I was surprised when I didn’t have this feeling at all being underwater. Everything feld calm, the time seemed to have stopped and you feel part of the underwater world, not just an observer. The deeper we went the more confident I felt – just until I recognised that my mask was running slowly full of water. A second of panic came through my mind, but the calmness of the sea made me relax a little. I looked up – maybe 3 meters. Not too deep to be afraid of going back up again. I did this lots of time, when I was diving for pretty mussles below me as a child just with the mask and no air. I showed my instructor what was happening and gave him the signal to get back up again. My instructor however tried to show me with simple movements how to get the water out of my mask, without getting back up to the surface. A child record came to my mind. My dad always tried to show us in the pool area how to get that water out of your mask, but I was never able to do this. I just tried to do it without too many hesitations. And the best part? It actually worked! Proud of myself I was ready to go deeper. All around me the deep and dark blue water. The more we went downwards, the closer we got to the riff and the more close by the fish were swimming. Typical for Egypt, the fish weren’t afraid of the people swimming down there. Genuine and calm they were swimming around me totally ignoring me. I didn’t feel like I was trespassing in their area, but I felt part of it. The colours you can see underwater are powerful and unimaginable. Every second, that the sun came out everything started to sparkle around me. Even the riff was filled with light and power. Going deeper everything got easier, the pressure control, the breathing and the enjoyment. My instructor was great, everything was at my time and my confidence. I never felt pressured or like things were going too fast. Close down to the sand he showed me his watch, it said 9m. I was surprised. It didn’t feel that deep, it didn’t feel scary and it was still full of light. I expected it to be darker down here – but the difference was minimal. Little later we started to slowly go back up again. I was breathing in deeply, which I was told is the most important thing while going back up. The instructor accompanied me back to the boat and I started to climb the stairs up the boat, until I figured out that I wasn’t able to. I had totally forgotten how much the air pressure bottle weights. I took together all my power and took one step upwards. While I was trying the second foot step I understood, that I wasn’t able to go further. A guy from the boat luckily helped me back out of the water. Once back up on the boat, I tried to get out of my suit the faster the better. My mouth was dry and my body all over showing chicken skin because of the cold air. To warmen up the first thing that I needed was a cup of hot tea! I hope I took you down there with me and if you have your own story to share, please let me know in the comments. Diving can be amazing. 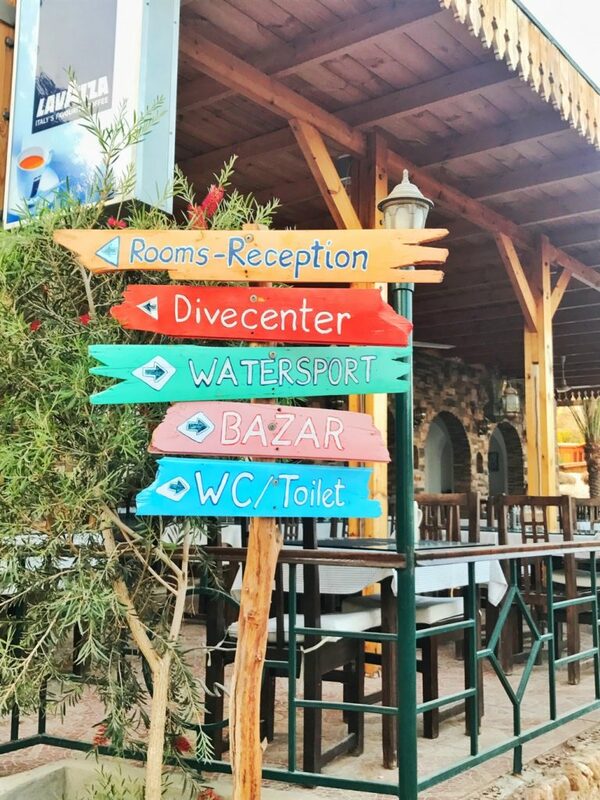 I have heard that Sharm el Sheikh is a very good dive spot. I would love to go diving. It would be such a fabulous thing to do. For medical reasons I don’t think I would ever be allowed to but I do love to snorkel. 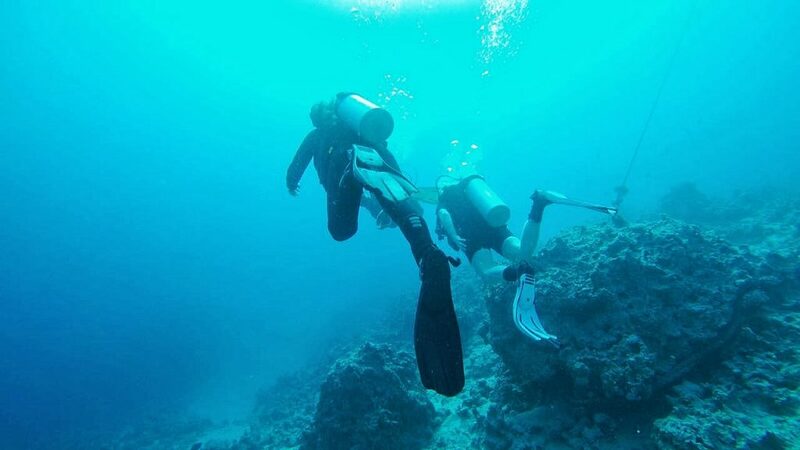 I’ve never tried diving before as I’m afraid of going deep under water, but your experience seems quite cool! Thanks for sharing in such details about your first time of diving. I seriously think now about trying it some day. Hi Fiona! Thanks for your comment! As I said in the blog post, I was super afraid myself and if the moment wouldn’t have been as it was I would have NEVER tried diving ! I sure would want to do this. So much of fun and color down there. Fingers crossed that I get my certification and head there soon. Your words are so descriptive; a few times I was actually holding my breath while reading the article! I can’t say that diving is “on my list”, but you’ve inspired me to at least consider it at some point in time. Wow! Sounds like an awesome adventure! I’ve never been to diving earlier. Hope I’ll get a chance soon in future! Those pictures are absolutely stunning! I have done snorkeling a lot of times and I am planning to go diving soon here in Australia! I tried diving for the first time in the Dominican Republic. It was as much an exercise in overcoming fear as just diving, but I loved it. Just a shame that I waited 56 years before trying it! Nicely written blog and gave the glimpse of how it would be for the first timer! Do you remember the name of the company you booked your diving tour and their coordinates by any chance?